The Kent Smarter Travel Challenge 2015 is open to all businesses in Kent. It starts on Monday 1 June and runs for four weeks, with the chance to keep logging journeys to compete for prizes for a further two weeks. It’s hosted by Sustrans in partnership with Transport Innovations at Kent County Council. The idea is very simple - for a month, businesses log how many “smarter” journeys are made. Vehicular travel is not excluded but it just has to be by public transport, an electric car or car sharing with at least one other employee. Even working at home (not travelling to work) or attending a virtual meeting, count. Obviously walking and cycling journeys qualify. So it is very inclusive and can involve all employees. It’s not obsessively about cycling! The idea is to get businesses thinking about these alternatives and about generating more interest in active and sustainable travel. There are loads of prizes to be won in both the individual and the company categories. Businesses can compete with each other to win their category by logging the most sustainable miles and saving the most CO2. A staggering statistic has revealed that in Kent and Medway last year over 350 pedal cyclists and 400 motorcyclists were killed or injured in crashes where other vehicles were involved. This has prompted Kent County Council and Medway Council to join forces in a campaign to makes motorists more aware of cyclists and motorcyclists. 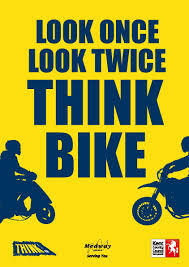 Between May and June there will be highly visible boards with the message - ‘Look Once, Look Twice, Think Bike’ - placed at crash hotspots and prominent places, a radio advertising campaign and on the backs of buses throughout Kent and Medway.